Thought to date from the early 1700's when it was constructed as a gentleman's townhouse, the Kings Head Hotel has been a landmark of the famous little town of Richmond ever since. Unsurprisingly Grade II* listed, the building is known to have been visited by two giants of the creative arts during its illustrious history: JMW Turner and Franz Liszt. The former visited on two occasions (1797 and 1816) and described the hotel as "the finest in Richmondshire". It is known that the artist's second stay at the Kings Head coincided with a tour during which he produced a number of watercolours to illustrate Thomas Dunham Whitaker's 'A General History of the County of York'. The hotel's connection to Franz Liszt, meanwhile, is that it is recorded that the composer performed a piano recital in the hotel's ballroom on the 27th of January 1841. 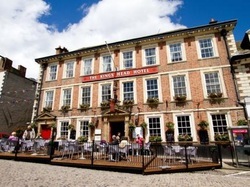 Today the Kings Head offers 26 guest rooms in total, with "Larger Rooms" overlooking Richmond's delightful Market Place. Moreover, those hoping to explore the delights of North Yorkshire with their dog will no doubt be pleased to learn that the hotel has a number of pet friendly rooms.